With all that takes place in our lives, it can sometimes be easy to overlook the fact that we’re part of something greater than ourselves—a collective consciousness, the Universe, a greater cause. Because of our tendency to forget this, we might make decisions in our lives that don’t reflect that responsibility that comes with this belonging. All too often, we focus just on the short-term, tangible gain to ourselves without worrying about its consequences. Other times, we may discard the greater cause because it seems like “hard work.” The challenge is to expand our minds so that we transcend the distinction between self and others, so we are aware of how our choices and actions can impact a greater cause. Contributing to the greater cause doesn’t have to be all about self-sacrifice. For example, if you plant a tree in a community space, its shelter will cool and protect you as well as your neighbors. Or, your reward might be in the form of the beauty that you now see in that space or the sincere smiles of appreciation from neighbors. When you serve the greater cause you also serve your greater good. There is nothing that you cannot do for your highest good that will not benefit the good of all. For example, saying no to a relationship that isn’t right for you not only benefits you but serves the greater good of the other person that you are honoring with your honesty. Saying yes to your dream job not only fulfills you but also serves the people that will benefit from your enthusiasm and productivity. When you know you are serving a greater cause, there is little room for fear and doubt. You know that what you do will benefit others, so there is no way the universe is not going to support your efforts – even if sometimes it may not look that way. Serving the greater cause allows you to live from the space of your greatness. When you know that what you do can serve a greater cause, you are aware of your power and ability to influence and create change in this world. A great place to stop for meals or supplies on the Glenn Highway. The Jonesville Cafe is the home of the valley’s best burgers made with quality lean beef. We feature real home cooking and is ar famous for our homemade pies. In the mood for some eggs in the afternoon? Breakfast is served all day! On Saturday nights we server fresh baked pizza. Sutton is a small Community that was founded in 1918 as a station on the Matanuska Branch Railroad, as well as a wash plant site for the US Navy’s Chickaloon Coal Mine. Sutton’s growth was then spawned by development of several nearby coalmines in the 1920’s, which produced coal to meet a significant portion of Alaska’s energy needs through the mid 1960’s. Evan Jones Coal Mine, Located just north of Sutton, was the largest and the most productive of the Matanuska coal producers with an average employment exceeding 100 miners. For nearly half a century, the Evan Jones Coal Mine supplied coal to various customers that included the Alaska Railroad, Local Military and Utility power plants as well as domestic heating for customers with total sales exceeding six million tons. The Alaska Railroad switched to diesel powered locomotives during the early 1950’s and local Military and Utility power plants converted to natural gas in the late 1960’s which eliminated local demand for coal causing the Evan Jones Coal Mine to close in 1968 with little hope of ever re-opening. Today, more then thirty years since the closure of the Evan Jones Coal mine, there is renewed interest and optimism that once again the high quality coal of the Matanuska Valley could pay a meaningful role in meeting Alaska’s growing energy needs. The Alpine Historical Society in conjunction with The Sutton Activity Coordination Board sponsor this event. 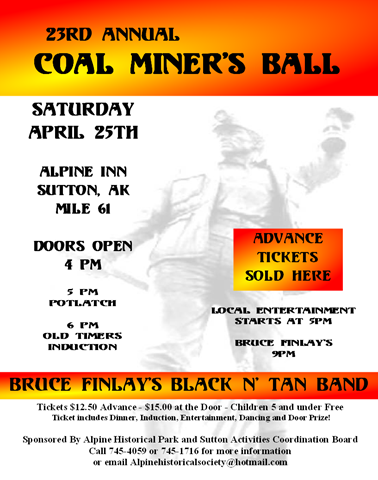 The Coal Miner’s Ball, will be held at the Alpine Inn at mile 61 of the Glenn Highway, in Sutton, Saturday, April 25th. The Coal Miners Ball is The Alpine Historical Society’s largest fund raising event of the year. It is designed to honor those that came before us with a Old Timers Induction to Hall of Fame, entertainment, a potlatch, dinner, dancing and door prizes. The Alpine Historical Society has been managing the Alpine Historical Park since 1984, when land exchanged between Phil O’Neill and the Mat-Su Borough. 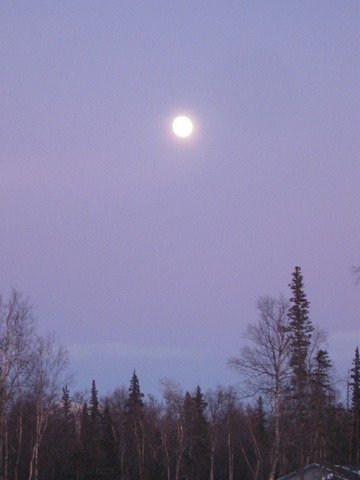 The Park is uniquely situated directly on the Glenn Highway at mile post 61.6 and Chickaloon Way in Sutton Alaska. The local Glenn Highway National Scenic Byways Committee has selected The Historic O’Neill House to represent this area as the Glenn Highway Scenic Byway Visitors Center. This important Historic Park is 23 minutes from Palmer and a beautiful one hour drive from Anchorage. The tax deductible contribution is $12.50 advance, $15.00 at the door, per person, children 5 and under free. Tickets include Dinner, induction, entertainment and door prizes. Doors open at 4PM. This year’s main event entertainment The Bruce Finlay’s Black N’ Tan Band starts at 9PM. Proceeds from this event will provide local activities for young people and families in the Sutton – Chickaloon area. As well as to maintain programs and facilities at the Alpine Historical Park. Senior Citizens Discount Tickets are available. Advance Tickets will be on sale at local businesses throughout Wasilla, Palmer, Sutton and Anchorage. Look for our poster displayed. The Alpine Historical Society (AHS) is a non-profit organization established to encourage the preservation and utilization of the Sutton and Chickaloon historic resources as a cultural, economic and educational asset for the community. As a nonprofit, the Alpine Historical Park relies on membership, in-kind donations, charitable contributions and volunteers to sustain the expenses of keeping our beautiful historical park open to the community and visitors from afar to enjoy. The Alpine Historical Society oversees the operation of the Alpine Historical Park in Sutton, AK which is host to the “Old Timer’s Hall of Fame”. Additionally the AHS hosts the annual Coal Miner’s Ball, the Old Timer’s community picnic, the Valley Trash Show and Shine Car Show, as well as participating in community events. This year promises to be one of our best years. Through the cooperation and grants from the State of Alaska, Sutton will be getting a New Public Library. As Board Members of the Alpine Historical Society we thank you for your support of the new Sutton Library Project. The Alpine Historical Park located adjacent to the new library site will be sharing our facility’s infrastructure. The Historic O’Neil House, situated on The Alpine Historical Park property has been identified as the selected site, by the Glenn Highway Byways Committee as the Glenn Highway Visitors Center. We currently have grant money in place to continue with restoration of the O’Neill House this summer and another grant with MAT-SU HEALTHY IMPACT GRANT PROGRAM, Titled – “A Trail to Better Health Begins in Sutton” to install lights, expand our trail system and install exercise equipment near the existing playground equipment per a recent request from the community. We are working with the Sutton Community Council and the new Sutton library site to coordinate a safe place for our community to play and exercise for young and old. We are within walking distance of the Sutton Manor Senior Center, and Sutton Elementary. The Sutton Public Library/Community Center is currently on the Mat-Su Borough’s Capital Improvement List which has been submitted to the Alaska State Legislature. We are hopeful that the bill was passed, SB119 sponsored by Senator Bert Stedman and will receive funding this year. Additionally, the Borough has included the Sutton Library on their priority list of Federal Economic Stimulus Projects, submitted to our US Congressional delegation. Our vision is to unite with all communities along the Glenn Highway in a co-op combining all of our efforts so we all will prosper. The purpose is to include a visible and accessible environment to our community and tourism as a focal point year round. Visitors to The Alpine Historical Park will find many historical buildings with informative displays of Coal Mining, Glenn Highway Construction and Athabascan Culture. The Park is home to the Coal Miners Hall of Fame and pictures of inductees are displayed. Perennial flowerbeds, picnic tables and playground equipment welcome visitors to the park. In the coal boom era of the Matanuska Valley, Alaska Central Railroad laid tracks from Seward through Sutton. The coal from the Sutton area was used to power the steam engines. The Wishbone Coal Mining Company built the “Washery” to clean the coal mined in Eska and Chickaloon mines until 1922. The foundation of the coal washery and several pieces of historic mining equipment rest in the park. Road builders, including many locals who still live in the area, built the Glenn Highway portion of the Alaskan-Canadian Highway in a period of months. The park features an indoor exhibit of photographs and history of the building of this highway. The Athabascan people of Chickaloon have maintained their traditional culture and are working with the Historical Society to interpret their history. 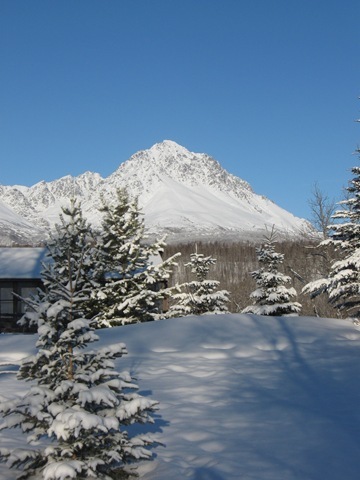 The Park is located in the heart of the Matanuska Valley on the Glenn Highway at Mile 61.6 in Sutton, Alaska. 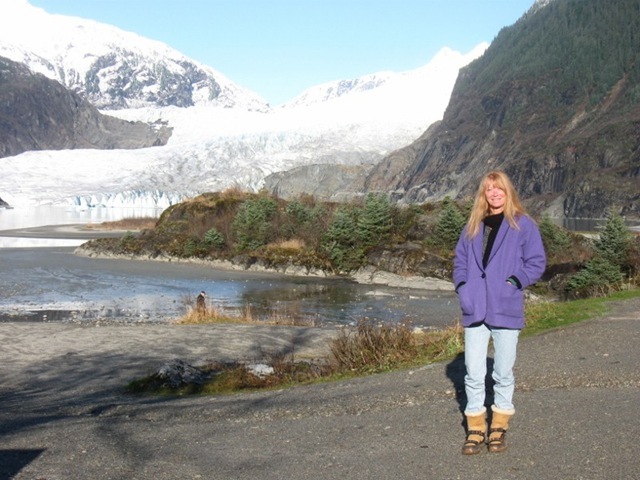 The Park sits on 6.6 acres bordering the powerful Matanuska River. 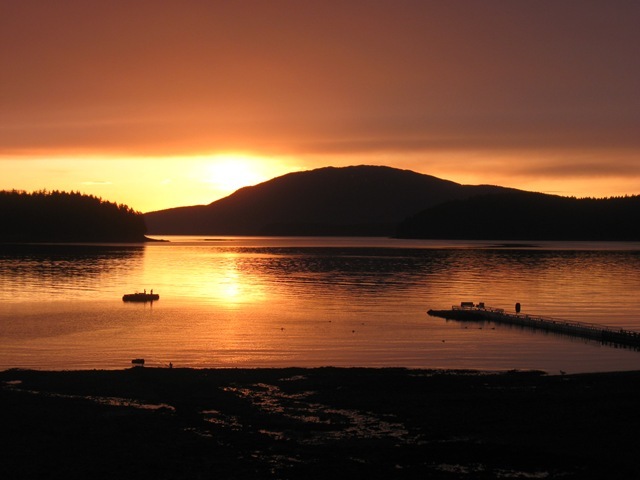 It is just 14 miles from Palmer and a beautiful one-hour drive from Anchorage.